The region between x-axis and graph of function f on interval [a,b] has (net) area which can be approximated by Riemann Sums computing total area for a collection of adjacent rectangles with one side on axis and opposite side with a corner on the graph. Function f can be revised by typing a new expression in upper-right box. 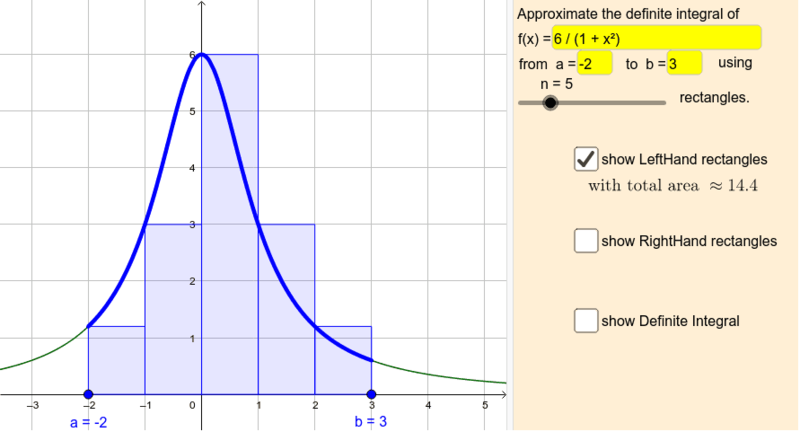 Ends of interval [a,b] can be changed by dragging points on x-axis or entering new values in labeled boxes. Note that the corresponding part of the graph is thickened. Choose number of rectangles with slider for n.
Use the checkboxes to choose what to display.